I know a lot of you guys had settled on the name Patches for the kitten, but though it was cute, it wasn’t quite unique enough. Retrokitty was another good one, but he’s not always going to be playing old stuff. I settled on Glitch because I think it suits him, so I hope you guys like it. As if the writer answered my question through a comic! Awesome! Specialty: Genome Drain. Learns the abilities of monsters. But it’s short for Barfolomew. Wynaut stop all these puns? I was wondering when you would announce his name in the comic, you had already named him publicly in the character’s info part of the site. Damn Spoilers. You want to name a CAT Barfolomew? Really? LMAO nervous vomit. Poor Glitch. Glad he gets to stay! but what is the gamercat’s name? duhn duhn duhn!!!! I was just thinking. Makes total sense to me. And Patches doesn’t really match the theme of the comic anyway, considering the main character’s named Gamercat (possibly)…. Ah, but patches are made by game developers all the time. (^-^) It’s actual gaming terminology. Especially when DLC is announced, patches are often included with the added content to make them more compatible with the source code. But Patch would make more sense! I think he’s actually the Mew Glitch. And I would preorder plushies of these to the minute they came out……..
Lucky he didn’t name him Barf. Really, if you’re an animal lover, you have to be okay with a little puke. That sounds like a four-year-old’s Valentine’s card. Hmm? Perhaps a new female kitten named Patches becomes smitten with Glitch? I think that’s a wonderful idea! And it’s true. I’m a girl and I love to play video games. I actually have a girl gamer cat planned. She’ll come around eventually. Wasn’t there one in the Journey comic? I think this is already getting rather cat-heavy. The girl character should be a dog, but not just any dog, a scary-looking pug who noone wants anything to do with until they actually talk to her and discover she’s really a very nice person. Then they feel like assholes for shunning her. Nice introduction! Again, love your style and the manifestation of the characters! P.S. : Did I write “awesome” about three times? Doesn’t matter, can’t write it often enough. rofl Glitch, that is absolutely perfect. So cute. XD This page made me LOL. 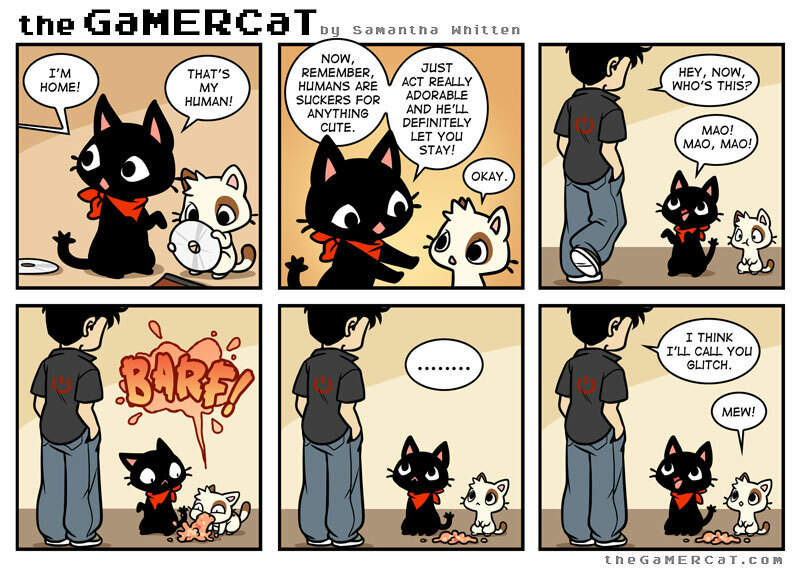 I know it’s just a webcomic and it’s better not to think too much into it but… does the human call gamercat, gamercat? Yes, his name is Gamercat. That is downright adorable. I’m keeping him. Neither. Must’ve caught rabies while in that trash can. Actually, it was just a random puke that cats seem to do. … That is one laidback guy. I wouldn’t react so well to a mysterious kitty puking in front of me. Kudos to him! And sympathy for the newly-christened Glitch, who needs Tums. As a cat owner, you get used to it. Cats puke at random times for seemingly no reason and, if you’ve owned one long enough, when they do that you just sigh instead of freaking out about it. The owner might be scared that a random sick cat is in his house. I mean cats living on the streets have all kinds of diseases, so it wouldn’t be that strange to be cautious. True, but I’d rather avoid the drama of the reality of a potentially sick stray cat moving into one’s house since this is a light-hearted comic. So I’m chocking this up to living in an idealistic world where it’s normal and nothing to be too concerned about. :-3 I agree, this is a fun/silly comic that doesn’t need that kind of seriousness. Glitch’s first impression was so awkwardly cute for some reason. Uh, no. Pretty sure Gabe has much longer bangs. I really am curious as to what GaMERCaT and Glitch’s voices would sound like. GaMERCat… would probably sound like a teen, deep but still young. Glitch I can only imagine him sounding either like “Spike” from MLP:FIM or “Tails” from the old Sonic cartoons. This is just like my kittens, I come home ask how their day was and bam! One or both of them pukes then stares at me. I tell them they are lucky they are cute, clean it up. Then I lay a towel down on the floor in the sun beam. When the sun moves I gently drag the towel to keep them in the sun beam. Lather rinse and repeat. Good thing it’s not a dog, it would start eating his own vomit. I thought that the human would be your projection. Who announces that they’re home to their cat? A really awesome owner, or Jon Arbuckle. Actually I do that when my Dog greets me at the door. This cat has strange resemblance to Sakamoto-kun from Nichijou. Perhaps that could be a comic idea? Just found this awesome comic! Please keep it up! Oh, and as I use The Webcomic List to keep track of those comics I read, I noticed that The Gamercat profile is somewhat lacking in the image area. Perhaps you can fix this with some awesome gamercat imagery. So will we finally learn GamerCat’s real name? Found your comic today, read the archives. Now it’s on my list of watched comics. Really great work, love the art style and the light heartedness. Actually I want to commend you for being honest about the nature of cats. By the way, this is actually a surprisingly true story. Our cat once invited over a stray into our house. He lived in our basement, running and hiding from us all the time. Also, are we ever going to see the owner’s face? lol this is purrfect all they need is a rival gamer OH! perhaps a female rival gamer secretly liking each other! To much? Hmmm… How old is Glitch? Reboot really did deserve to finish its storylines. A pity it was cut so short. Oh my Gosh, this is ridiculously adorable. Uhh.. There’s a cat advertisement on my screen. Should I be scared? If I was the Owner. “You can stay if you beat the Elite 4…” cause I’m just that heartless. “G…a…MERC…CaT” ==> Gee, a MERC-CaTtey! ==> Gee, a MERC-Kittey! here’s an idea lets say its JUST FREEKIN GAMERCAT!!!!!!!!!!!!!!!!!!!!!!!!!!!!!!!!!!!!!!!!!!!!!!!!!!!!!!!!!!!!!!!!!!!!!!!!!!!!!!!!!!!!!!!!!!!!!!!!!!!!!!!!!!!!!!!!!!!!!!!!!!!!!!!!!!!!!!!!!!!!!!!!!!!!!!!!!!!!!!!!!!!!!!! do u think i CARE?!! make a book of it! FINALLY I CAN TALK ON HERE WITH MY NEW GRAVATAR! I like your comics. i read them every week! Why are the anonymice a main character when they only appeared in one single comic strip? When did someone say that they’re main characters? did he eat the disc he was holding? The creator should make a girl character (who loves games) for GAmercat later down the road. Who agrees? I Wish the cat would be named MissingCat as a reference to missing no. OMG GLITCH LOOKS JUST LIKE JETPACK KITTY FROM TECHNO KITTEN ADVENTURE!!!! Are you dead, or just really busy? i now right? WHEN THE HECK ARE YOU GONNA MAKE ANOTHER COMIC!!!!!! ITS BEEN ABOUT A MONTH NOW!!!!!!! I AM FREAKISHLY DESPERATE!!!!!!!!!!!! is the human gonna be added to the characters? or is it gonna be when we see his face? hey! just wanted to say lov your comics! In my opinion you should do a strip about Animal Crossing. I understand if you haven’t played it, but i would still love it. Is glich a boy or a girl? P.S. I want a cat to play video games with too!!!!! If the joke was intended props. If not I wont explain it because that ruins it. Kid got lucky, because I would’ve been disgusted. How do I get an account?